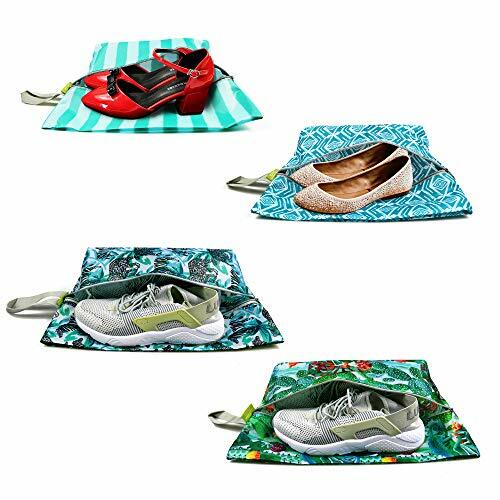 BeeGreen travel accessories shoe bags for women with beautiful pattern are made of 210D polyester, its a lightweight fabric but very sturdy and water-resistant, Hand-Washable, hang to dry. Have 2 pack standards size and 2 pack x-large size, fit shoes under size 10 and size 14. With smoother zipper and stronger straps, it is your best choice. KEEP YOUR CLOTHES CLEAN: BeeGreen travel accessories shoe bags are definitely your perfect travel partner, if you want to organize your suitcase and don't want your clothes get dust and smell from your shoes. 2 LARGE SIZES FOR YOU: BeeGreen travel accessories shoe bags have 2 sizes, 14.5*9.25 inch, fit for shoes under size 10; 17.4*9.5 inch, fit for shoes under size 14. Great sizes for your shoes or boots when traveling. DURABLE & LIGHTWEIGHT & WATER-RESISTANT: BeeGreen travel accessories shoe bags are made of High Density 210D polyester fabric, it's very sturdy but still lightweight, easy to pack into your suitcase. And you don't need to worry that wet shoes may touch your clothes. MORE THAN SHOE BAGS: BeeGreen travel accessories shoe bags are not only for travel shoes storage. You can use these bags to organize small items, undies, socks, dirty laundry when traveling, also great for gym, camping and so on. 180-DAY WARRANTY: BeeGreen provides you a 180 day warranty. If there is any problem with our travel accessories shoe bags after you received them, please do not hesitate to contact us for a replacement or a refund. BeeGreen looks forward to provide you better shopping experience!